The European Court of Human Rights (ECHR) ruled on Feb. 23 that Russian opposition leader Alexei Navalny's and businessman Pyotr Ofitserov's right to a fair trial (Article 6.1 of the European Convention on Human Rights) was violated in the so-called Kirovles case in 2013, the ECHR said in a press release. "The Court found that the conviction of the applicants' co-accused in separate accelerated proceedings had deprived the applicants of basic guarantees of a fair trial," the document says. "Moreover, the Russian courts had found the applicants guilty of acts indistinguishable from regular commercial activities. In other words, the criminal law had been arbitrarily construed to the applicants' detriment," the ECHR said. The court ruled to pay Navalny and Ofitserov in aggregate over 80,000 euro in compensation for damage caused to them. "The Court held that Russia was to pay each of the applicants 8,000 euros (EUR) in respect of nonpecuniary damage, and in respect of costs and expenses EUR 48,053 to Mr. Navalnyy and EUR 22,893 to Mr. Ofitserov," it said. Navalny has already reported about the ECHR's judgment on his website. "The ECHR has recognized the Kirovles case as one violating the right to a fair trial. Ofitserov and I have been awarded 8,000 euro each as compensation for damage. 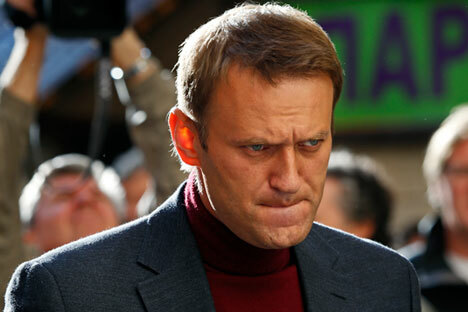 Another 22,000 euro and 48,000 euro has been awarded as compensation for judicial expenses," Navalny said. He pointed out that the Russian Supreme Court now must invalidate the lower court's ruling in the case. Moscow's Nikulinsky Court had ruled in October 2015 to recover 16 million rubles in favor of the Kirovles company from Navalny and two other people figuring in the case. The case documents say that the claimants had demanded "recovering 16,165,826 rubles from Vyacheslav Nikolayevich Opalev, Alexei Anatolyevich Navalny, and Pyotr Yuryevich Ofitserov solidarily in favor of the Kirovles state company in compensation for material damage caused to the claimant by the crime." The Leninsky Court in Kirov had sentenced Navalny to five years in prison and Ofitserov to four years in prison on charges of embezzlement from Kirovles on July 18, 2013. Both Navalny and Ofitserov were taken into custody in the courtroom but were freed the next day with travel restrictions until the moment the sentence took legal effect. The Kirov Regional Court later overturned the Leninsky Court's judgment and gave Navalny and Ofitserov suspended sentences and a fine of 500,000 rubles. After hearing the Federal Corrections Service's motion on replacing Navalny's suspended sentence in the Kirovles case by real jail time in May 2015, Moscow's Lyublinsky Court declined it but extended Navalny's probation period by three months, i.e. until April 2019.